Andrew Luck's right arm has held up under considerable strain the first five weeks of the season. INDIANAPOLIS — Andrew Luck‘s surgically repaired right shoulder is being tested in ways even he couldn’t imagine. And it’s something the Colts know must change to keep Luck on the field for the final 11 games. 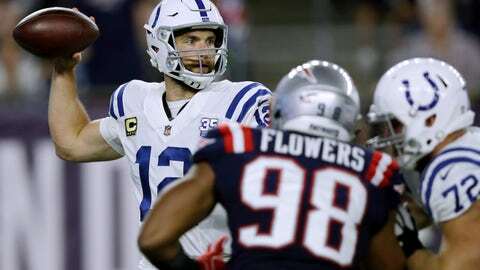 Luck’s 245 attempts through five games lead the league and have him on pace to throw 784 times this season, a number that would shatter Matthew Stafford’s single-season record of 727 in 2012. “You have that weekend off, which is sort of nice, especially in the one sense if you win — not so much if you lose,” he said. “We have to run the ball a little more effectively to give ourselves a consistent chance to win.